Gratitude. A vibration I am teeming with as I step off the plane in San José del Cabo, Mexico. Moments ago my pale naked toes in their flip-flops were buried, hiding underneath the soft airplane blanket. Now, a rush of the subtropical air embraces me after a frosty, but smooth two-hour Mexicana Airline flight. As the hot sun thaws me out, I begin to sense the anticipation for the coming days of little-to-no responsibilities. I make the 50-yard journey from the baking tarmac to the terminal and feel myself descending back into my body, step-by-step, flip-by-flop. Once inside, I settle into my Spanish speaking tongue. Customs. No problemo. Mis maletas y taxi? Si, por favor. I quickly find a shuttle to deliver me to my first destination, Casa Natalia, located in the town of San José del Cabo. While English is widely spoken here, I opt for practicing my español, in service to dropping into the culture and the land of Baja Sur. We cruise slowly down dusty Highway 1 and I recognize the signs of two worlds long since collided. Old Baja Mexico pokes through its rusted, barred windows corroding in the desert heat. The broken cars and trash heaps amidst modern one-story air-conditioned shops, and the ruins of “supermercados” the size of shoe boxes line the highway. As these images fade in the distance behind trucks and diesel fumes, I remember the promise of recent statistics that show Mexico moving into greater economic growth. Today, Baja Sur enjoys the highest per capita income of any Mexican state as well as the highest literacy rate in the country at 95%. Soon we turn off the highway towards ‘El Centro.’ “We are nearing your destination, señorita,” Fernando, the driver, informs me. At the end of the Boulevard Mijares in the center of San José, Casa Natalia is discreetly tucked away between jewelry tiendas. Through the entrance, it is obvious why this establishment earned membership in the Small Luxury Hotels of the World. The simple hotel façade belies a beautiful contemporary Mexican interior. Large glass doors and hand-hewn wood beams frame a comfortable lounge area and palapa bar. A long courtyard descends, from lobby steps to alfresco dining area, and stretches out to an elegant sun deck beyond. As I take in the setting of my temporary abode, a welcoming voice reverberates, “Hola!” I turn and am greeted with a warm hug and kiss by Natalie Tenoux, co-owner of Casa Natalia. She registers my wonderment of the stunning courtyard and remarks, “We have a lot of fashion shoots here.” The striking setting is a photographer’s nirvana, and Natalie is a warm and engaging host. She arranges for me to receive a massage this afternoon and shows me to my suite. My room is as inviting as the rest of the hotel, with its covered terrace and enticing hammock. The bedroom, with high ceilings and bed draped in Egyptian cottons, is spacious and airy. I unpack and make my way to the pool, where a gentle waterfall empties into the serene body of blue. I drift off on the chaise lounge, after finishing the first chapter of The Da Vinci Code, a morsel I have been storing away for exactly such an occasion. The late afternoon sun illuminates the architecture of Casa Natalia. Rich but simple hues beam with the essence of modern Mexico, creating an elegant contrast to the elongated shadows. The cinematic feel is unmistakable, yet the staff and atmosphere emanate a low-key, comfortable vibe that makes me feel right at home. This first night I have a delicious organic dinner with Armando Montano, the chef at El Chilar, a local restaurant in San José. For a night cap afterwards, I stop at a new wine bar called La Santa just down the street from Casa Natalia. San José is tranquil compared to her wild sibling, Cabo San Lucas, and La Santa is an intimate setting that fits in nicely. It has a tapas-like menu as well as a regular DJ spinning for locals and tourists alike, who clearly enjoy each other’s company. 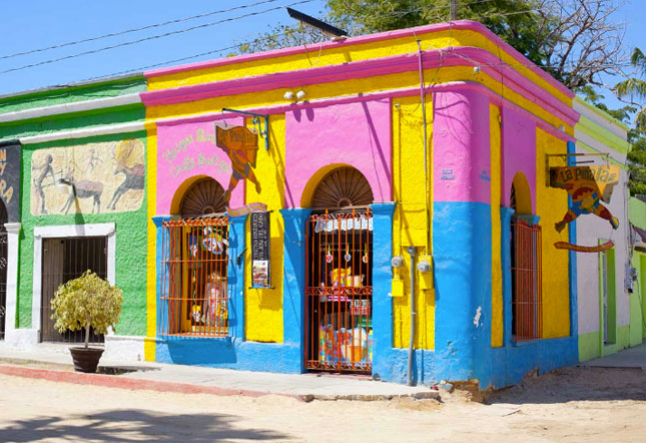 The next day I set out to explore San José del Cabo and discover that this quaint town has preserved its 18th century Spanish colonial architecture. Laurel trees flank pedestrian-friendly streets, and fuchsia, scarlet and peach bougainvilleas spill over the sun-drenched walls of the buildings. Located in the center of town is the historic church, the Iglesia San José, surrounded by an ample square filled with benches and poplar trees. The pace of life here lends itself to relaxed shopping and leisurely lunches, meeting expatriates, and perusing imported arts and crafts from Guadalajara, Mexico City and other areas of mainland Mexico. The restaurants offer a range of high quality of international cuisines with seafood as a mainstay. I take in the confluence of cultural rivers, soaking in the surroundings, the people and their expressions of life and art. This afternoon I am off to the one and only Palmilla Resort, along with a photographer friend, Lon, who has just arrived in San José. As the sun begins to make its descent through the melted sherbet sky, our arrival at Palmilla is nothing less than extraordinary. The staff greets us by name, and we are soon introduced to our personal butler, Martin, who escorts us to our suite. We walk with Martin and pass by other hotel staff, all of whom greet us by gently placing a hand on their hearts and then gazing warmly at us. “Can you take it in?” Lon asks. Good question.But I am already drifting into a memory of sunrise walks in the small town of Ujjain, India, where each passerby has Namaste on their peaceful lips. Smiling, I enter the elegant suite that opens to the azure expanse of ocean, and she insists that we drink her in. The Sea of Cortez is a deep blue, deeper than the stone lapis lazuli. It is a blue that you find in your most vivid dreams, or feel the color of in a song. Diving into her warm buoyant waters, luminous with floating golden sands, is a baptism, I later discover. A fresh fruit bowl with olives and nuts wait on the table alongside a letter of welcome with our itinerary. Tonight, we are scheduled for a dinner at Agua, one of Palmilla’s gourmet restaurants, and tomorrow, lime- and ginger-infused scrubs, as well as a yoga and qi gong lesson with the Yoga Director, Tony Gonzalez. Martin offers to unpack our things and we gently decline. He leaves us to take in the surroundings and enjoy this vibrant dusky hour before dinner. At Agua, Lon and I enjoy the mostly organic meals presented to us with our names on the menus, another distinctive touch of Palmilla’s hospitality. We eat slowly and take in the richness of the experience with each morsel of food and service. After dinner we leisurely stroll back to the suite, where we both drift off early to the lull of the gentle sea, rolling onto the shores of Punta Palmilla. I rise at dawn and watch the fiery sun silently roll itself out of the wet ocean, breathing in the solitude and stillness of morning. We make our way to the Yoga Garden for our yoga and qi gong class, followed by spa treatments. Tony is a skilled teacher with over 25 years of experience, and a treat for advanced and beginning practitioners wanting to whet their yogic whistle. Lon and I surrender to Tony’s instruction, giving our minds and bodies another opportunity to listen and stretch. After lunch and a leisurely nap by the ocean-side infinity pool, we depart for Todos Santos ,a small artist’s community on the Pacific side of the Baja Peninsula, 100 kilometers from San José del Cabo. But before we leave, the staff at Palmilla send us off with a departure gift. The luxury of Palmilla’s amenities and atmosphere is apparent, but the remarkable attention to details in the service and the heart-warming attitudes of the staff is unprecedented. Visiting Palmilla for the first time feels more like a homecoming than arriving at just another hotel. As we watch our bags being loaded into our car, we vow to return soon. This evening, we are booked to stay at the Posada La Poza (Inn at the Spring), a small, secluded ocean-side resort nestled between a lagoon and a bird sanctuary, just outside of Todos Santos on the Pacific Ocean. As we drive north on Highway 1, we pass the Tropic of Cancer. I flash again to Ujjain, the ancient Indian town of my own ancestors, recalling this same energetic line passing through there. Through the window, I watch the Pacific spread herself across the horizon. We arrive at the quiet hotel and are greeted by the owners, Juerg and his wife Libusche, a.k.a. Lilly. They show us to our room located in a beautiful subtropical garden of cacti and bougainvilleas. Lilly is also a painter and her work fills the main lodge giving it a vibrant and sensual ambience. Beyond the garden outside our cottage, Lon and I are struck by the serenity of the lagoon and estuary. A variety of birds inhabit the tall reeds and surrounding water. Tranquility has become a natural extension of the landscape here. We have dinner served in the lodge by Juereg, an excellent chef. We savor his home-style dishes of organic vegetables and freshly made bread and butter, and watch the sun dissolve behind the lagoon. Our stay in Todos Santos is short and we must leave sooner than we would like. In the morning, we journey north back on Highway 1, enjoying the wild Pacific coastline. This stretch of ocean is home to blue and gray sperm whales from February to April and while we don’t see whales on this trip, the abundance of wildlife in Baja Sur is palpable. Our last stop, Las Ventanas al Paraiso, or “Windows to Paradise,” also located in San José, lives up to its title. At the entrance gate, perfectly aligned solitary cacti appear to float in white sand. It feels as though we have arrived at a private Mexican estate. The grand palapa of the reception area neatly frames this spectacular view of the Sea of Cortez. Elsie, our butler with a tremendous smile, shows Lon and I to the Spa Suite, a new luxury addition to the resort. We venture down the path through the desert Zen gardens, arriving at our abode, and take the elevator to the second floor. The scent of lavender fills the air. Elsie demonstrates the features of the Spa suite, including: the Rainforest Shower, an Infrared Sauna, spa treatment room, and an infinity-edge Jacuzzi on the verandah. I am clear about my one responsibility on this journey – learning how to receive. Taking in the luxury and prosperity of life is sometimes a daunting notion for truth and spiritual seekers like myself. Somehow it has seemed for me easier to give than receive. But isn’t receiving the abundance here as much a part of life as a daily sadhana? I absorb the incredible expansiveness of the ocean and feel myself tingling from recognition. The treatment room has already been prepared for our sessions. Las Ventanas is world renowned not only for its hotel, but for its spa, and I am honored to receive my treatment from Spa Director Damien Viera. Damien’s work involves the use of special quartz crystal tuning forks and bowls. Lon receives a neuro-muscular deep tissue massage from Fernando, who teaches and runs the only massage school in Baja Sur. In 90 minutes, we are both transformed. These treatments go beyond any spa service I have experienced; they are truly healing. With another beautiful evening in Los Cabos upon us, we head to the Restaurant at Las Ventanas, where the Executive Chef has arranged an outstanding, authentic Mexican six-course meal. A waiter comes to replace my white napkin with a black one to match my dress, and I thank him. Lon and I look at each other and smile. Sometimes love is in the details. I look out across the aqua waters of the pool beyond the white sands into the deep blue of the Sea. The moon shines across the hushed body of darkness, whispering her own graces.